I finally got around to doing something with my Mixcloud page. Here’s my first mix. There’s no specific genre, just songs I love. This entry was posted in Uncategorized and tagged define sweaters, demon sweaters, demonic christmas sweaters, demonic sweaters podcast, folkes, folkston, folktales, miharu koshi, miharu koshi boy soprano, miharu koshi parallelisme, simon phillips, simon phillips drum solo, simon phillips drums, the cabs are here, the cabs band, the cabs japanese, the cabs of cpr are, ultravox, ultravox dancing with tears in my eyes, ultravox vienna, yello i love you dance mix, yello the race carrera mix on March 17, 2017 by DemonicSweaters. The song MIDIPLUS was created using Rosegarden and Qsynth with my custom made Kawai K1 soundfont and the Hexter DX7 emulator for Linux. I sequenced the track music all in Rosegarden, then used the Jack sync feature to sync to Mixbus and recorded the drums. I then outputted the audio from Qsynth into Mixbus and mixed it all there. Unfortunately I only had 4 channels for drums to work with this time and since all 5 toms were bussed to a single channel they came out sounding a bit thin. Oh well, still had fun and think it came out decent. The song is in 7/4 and I wanted to do an odd time song with double kick, so this is the result! This entry was posted in drums, My Music and tagged attack drum heads, attack drum heads best for rock, attack drum heads logo, attack drum heads official site, attack drum heads pack, attack drum heads review, attack drum heads reviews, define sweaters, demon sweaters, demonic christmas sweaters, demonic sweaters podcast, demonic weather, drum play through, drummer, drummer boy, drummer boy justin bieber, drummer boy lyrics, drummer carrington, drummer lyne carrington, evil sweaters, infant annihilator drum play through, midiplus ak490, midiplus akm320, midiplus miniengine, midiplus smart pad, midiplus tbox2x2 usb midi interfaces, music play throughout powerpoint, nuvader cymbals, nuvader cymbals wiki, nuvader hi hat cymbals, tama drums, tama drums for sale, tama drums history, tama drums pictures, tama drums reviews, tama drums set, tama drums wallpaper on March 12, 2017 by DemonicSweaters. Got a cool package from Japan today from my good friend Satoshi Inoue. 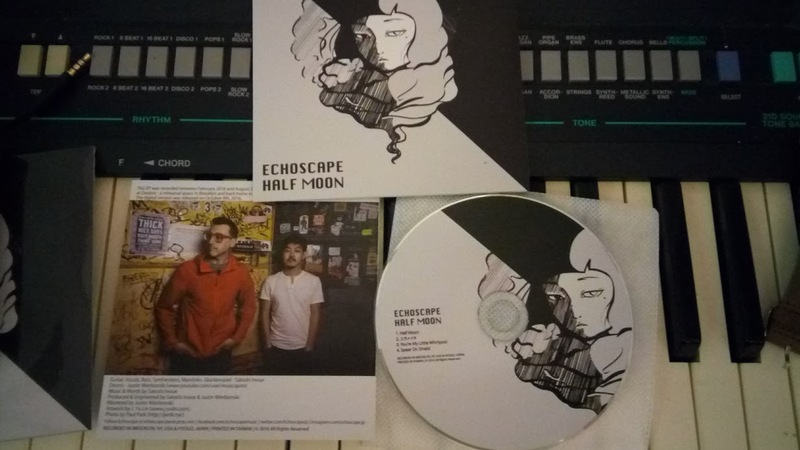 His project, Echoscape features me on drums on the EP, Half Moon. The CD came out great and has very high quality eco-packaging with a full color insert. We recorded it half here and he finished it up in Japan. You can order it at Echoscape’s bandcamp page on CD or digital download. Definitely check it out. I’m super proud to have played drums on this amazing release! This entry was posted in Uncategorized and tagged define sweaters, demon sweaters, demonic christmas sweaters, drummer, drummer boy, drummer boy lyrics, echoscape, echoscape records, echoscapes wausau, japanese math rock, japanese math rock bands, japanese math rock reddit, madewell echoscape earrings on January 20, 2017 by DemonicSweaters. Ronan has always been a huge supporter of what I do, possibly the biggest supporter. I thank him once again for hosting this exclusive stream. You can stream the whole album for free now, as well as pre-order it for only $5! The legend of Polybius goes that In 1981 a strange video game showed up in a select few arcades in Portland Oregon. Kids who played the game seemed to experience amnesia, forget who they were, where they lived etc, and suffer from extreme night terrors. The game was reportedly serviced by men wearing black coats who instead of collecting the quarters from the games, took only data from “records” inside the machine. Rumors were starting to grow that it was developed by some military intelligence agency such as the CIA. The game was not around long and was pulled from the arcades nearly as quickly as it arrived. There is no known machine in existence today, but ROMs have surfaced over time, though the authenticity of them has not been verified. I first learned about the game on the Astonishing Legends Podcast, and thought the story was so amazing and also felt it was the perfect inspiration for my new album. Three main recording devices were used in the making of this album and will be listed as Systems 1, 2, and 3 in the rest of the liner notes. System 1 – 2007 Black Apple Macbook running Ubuntu 16.04 LTS and Mixbus 3 with Jack as it’s primary DAW. System 3 – 2012 Samsung Chromebook running Ubuntu 12.04 w/ IceWM desktop environment and Ardour 2 with Jack as it’s primary DAW. 2. Helicopter Cop – Recorded on System 1. Music sequence created in LMMS using all software synths/samples contained within LMMS software. Stems exported and mixed in Mixbus3, live drums recorded using Alesis IO4 audio interface in conjunction with built-in audio for 6 channel input. Mixed in Mixbus3. 4. Cerulean Blue – Recorded on System 2. Synth sounds were played on my Mothman 1000 and 2000 software synths for windows running on wine on System 1 physically routed to system 2. Exported to and mixed on System 3 in Ardour 2. 5. AM Ultra – Recorded on system 3, sequences created in seq24 using Hydrogen, Amsynth, Zynaddsubfx, and Hexter softsynths for Linux. Mixed in Ardour 2. 6. Polybius – Recorded on System 2 (long recording mode 15.62khz sample rate) Synths all played live on Casio CT-370. Drums recorded with two mics, kick and overhead mixed to a single track with a behringer micromixer. Mixed on system 1 in Mixbus3. 7. Tunnel of Dark – Recorded on System 2 (hi fi mode 31.25khz) Bass and drums recorded (1 mic) and exported from System 2 to System 3 and guitar was recorded directly into Ardour 2. Mixed on Ardour 2. 8. Flowers – Recorded on System 2. Main sequences created in LMMS, drums recorded in (2 mics) Aurdour 2, mixed in Ardour 2. 9. Autumn Sun – Recorded on System 1 except with Mac OS 10.6 and Cubase LE 5. Guitars and basses are all sampled and played via midi within Cubase. Drums recorded in (6 mics) and mixed in Cubase. 10. dev/null – Recorded on System 1 except on Mac OS 10.6 using Ableton Live as DAW. Synth sounds played on Casio CT-370 and sequenced in Ableton. Drums recorded in (4 mics) Mixbus 3, mixed in Mixbus 3. 11. Overlapping Spirals – Recorded on System 3 with seq24 used to sequence midi, Amsynth, Zynaddsubfx, Hexter softsynths, Drums (2 mics) recorded in and mixed in Ardour 2. This entry was posted in Music Production, My Music, Uncategorized and tagged define sweaters, demonic sweaters podcast, polybius, polybius arcade, polybius creepypasta, polybius game, polybius gameplay, polybius greek historian, polybius histories, polybius quotes, polybius square, polybius the histories, polybius video game, polybius wikipedia on January 7, 2017 by DemonicSweaters.